With Owners Representatives Master Yachts, built under the project name P85, Naval Architect Tripp Design and Interior Designers Dölker + Voges, this extraordinary luxury sailing super yacht of 85m combines outstanding sailing performance, state-of-the-art technology and reliability, with exceptional space, comfort and luxury – a combination rarely found on sailing yachts. 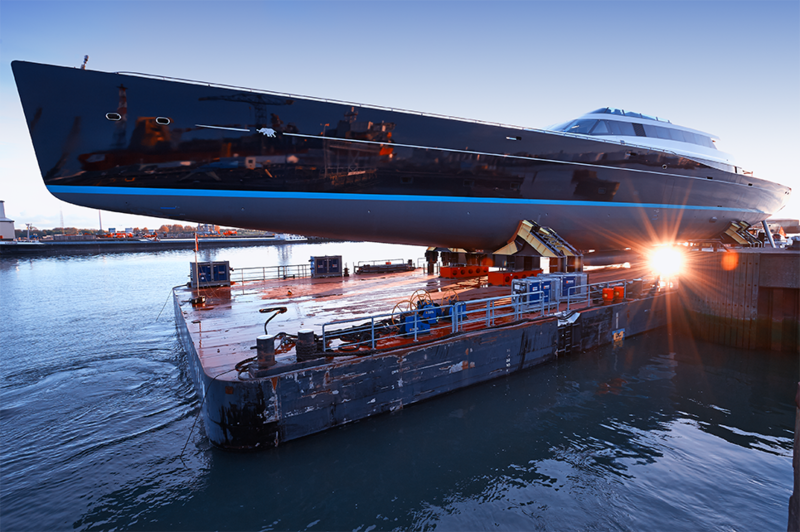 Oceanco and Vitters Shipyard worked closely through all stages of this bespoke project. During the Design Engineering Study, the Specification was defined by the yards’ teams, in close cooperation with the Naval Architect, the Owners and their representatives, Master Yachts. The yacht’s complexity lies in her sheer size as well as in the qualities that make her a real performance sailing yacht. Oceanco’s experience in building large power yachts in 80m+ range, and Vitters Shipyard’s vast experience in building large, high performance sailing yachts was the driving force in teaming up to manage such a complex project. Capitalizing on each other’s strengths, the teams broke boundaries with not only the size, but also the complexity, of an extensive array of advanced systems. The design and execution of all components of this 85-metre yacht ensure that guests and crew alike will sail in safety and comfort. Given her design characteristics, she will be as nimble and as easy to handle as a yacht of smaller dimensions, proving that a super sailing yacht can have competitive sailing capabilities with relative ease of handling. As can be expected from both naval architect and builders, this is a true sailing yacht, performing well at all points of sail and benefitting from exhaustive engineering and superior workmanship. The unique steering system, developed by Vitters Shipyard, completes the ultimate sailing experience. By translating the hydrodynamic forces on the underwater rudder blades directly to the Fly Bridge steering wheels, this steering system provides the helmsman with immediate feedback, a feeling for the boat.